Maybe it’s been awhile since you’ve been in to see us at Anchorage Dental Care, and if it has, you’ll be amazed at some recent advancements in dental technology. Dentistry, just like televisions, cell phones and computers, is now totally state-of-the-art! Take laser dentistry, for example. Dental lasers are used to “prep” a tooth for a filling, to “power” whiten your teeth and to perform surgery. They’re totally safe and you won’t believe all the benefits associated with them, from drill-less dentistry to no need for anesthesia to a reduced risk of infection. Seeing is definitely believing! Did you know that you can now fill a cavity without Novocain or using a drill? Microdentistry and air abrasion are incredible tools that allow us to identify tooth decay in its earliest stages, remove only the decay, leaving the healthy tooth enamel intact, fill the cavity with tooth-colored bonding material, and finally, seal the tooth to prevent further decay. Sounds easy? It is and far more enjoyable than needles and drills! Multimedia presentations provide you with an interactive patient education experience that helps you learn about different dental procedures and see how they’re actually performed. 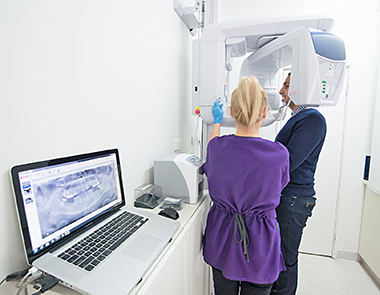 If you haven’t been to see us at Anchorage Dental Care for some time, you’ll be amazed at the ways we’ve integrated new technology to make your visit safer, more comfortable and just about as pain-free as you can get. You’ll like it here!